I can't remember why I was in the library when I found these two titles and took them home with me. 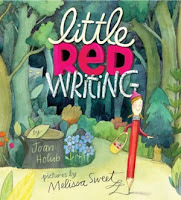 Little Red Writing by Joan Holub with illustrations by Melissa Sweet. 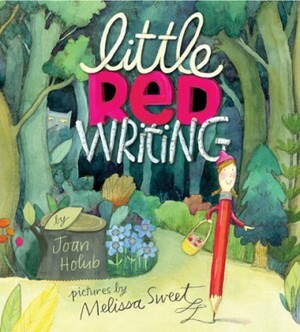 This is a clever, attractive book that deals with a red pencil that is writing a story while living the story she's trying to write. I found it a little complex, myself. Kids who are already good writers or have a big interest in it will probably enjoy this the most. Eats by Marthe Jocelyn and Tom Slaughter. This has no narrative at all, just two words on each simply illustrated page. One word is an animal name, the other is the name of something it eats. The reader (or reader and a child listener) adds the rest. When I had young children, I was not a fan of these kinds of books. I need story! 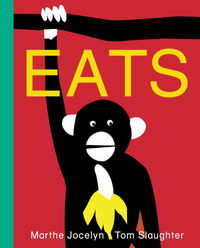 However, Eats was a huge hit with a three-year-old family member. I believe a couple of us read it with him three times over a long weekend. I think the last page was the grabber for him. A reminder that children's books are for children, not adults.